The distinguished contributors to this book examine the subject of corporate sponsorship, exploring the influences of powerful industries such as tobacco and pharmaceutical companies. They discuss the struggle for credibility and threats to free inquiry when special interest groups, right-wing think tanks, and discredited popular movements (such as intelligent design) infiltrate academia. Chapters on the middle eastern studies and First Nations universities look at external politics that inhibit intellectual freedom. The more insidious trends toward corporatization and “managerializing” the university also come under scrutiny. 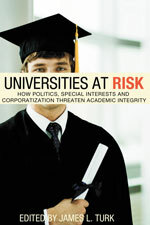 This timely book concludes with a discussion about why preserving academic integrity — despite the clamorous voices of the forces threatening it — is so vital to public interest.